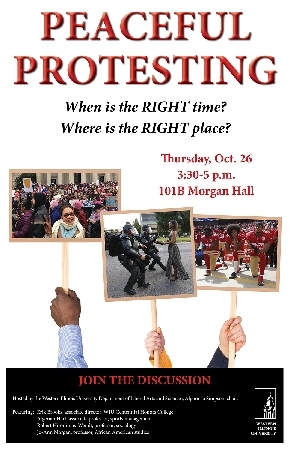 MACOMB, IL -- Western Illinois University's Department of Liberal Arts and Sciences (LAS) will host a panel discussion on "Peaceful Protesting: When is the Right Time? When is the Right Place," led by LAS chair and WIU Professor Alphonso Simpson, from 3:30-5 p.m. Thursday, Oct. 26 in Morgan Hall, 101B. The panel will include WIU Centennial Honors College Director Erik Brooks; Sport Management Associate Professor Algerian Hart; Sociology Professor Robert Hironimus-Wendt and African American Studies Professor Jo-Ann Morgan. The discussion will include viewpoints on when and where is the right time to proceed in a protest. Students are invited to attend and to participate. For more information, call (309) 298-2214.